THREE mindblowing perfomances in ONE magical night! BRADEN CARLISLE: Comedy magician who got his start in DC is now touring the country's comedy clubs. As a lover of all things magic, Braden is also a published author of magic theory book "Agree to Disagree" and hosts a weekly magic podcast titled "Awesome People Talking". CHRISTOPHE JELINSKI: Recipient of the coveted DC Magician of the Year award, Christophe is a master mentalist known for mind-blowing mind-reading that will have you doubting if what you saw was indeed real magic. TOMMY HALLADAY: First he is strange. Then he is wonderful. After cultivating a large online following on Instagram, Tommy Halladay is bringing his magic to the stage. He mixes in stunts and sideshow acts with magic to create something like you've never before seen. 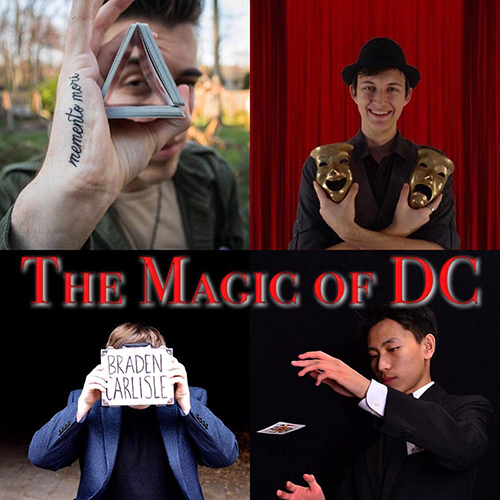 HOSTED BY BENJI TRAN: Benji works his magic in Washington DC by performing at local restaurants and is the host of DC's magic show The Magic Duel.